Now and a Long Time Ago: Prospect St.
Today on Now and a Long Time Ago, GM explores the curious Southworth Cottage. It was a gingerbread-style house that stood at the corner of Prospect St. and 35th. It was famously the home of E.D.E.N. Southworth, who is virtually unknown today but who was the Danielle Steele of the early 19th century. [Southworth] spent the rest of her life living and writing in Prospect Cottage, where she died in 1899. Her son inherited the house but died the following year, leaving it to his sister. Charlotte, who lived in New York, seems to have not had much interest in the house. Within years, it became something of a tourist trap. 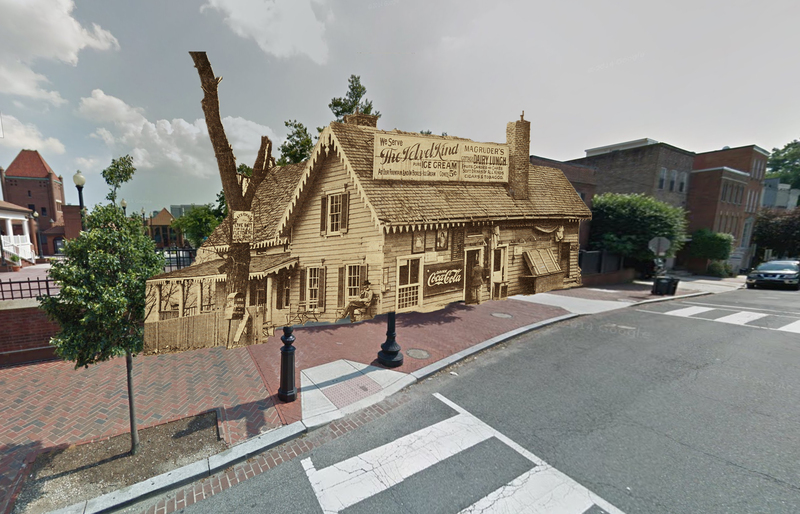 A Washington Post article from 1905 observed that “Now the sitting-room that Mrs. Southworth planned is an ice cream parlor, and the handsome, old drawing-room serves as a cafe. On the verandas visitors sit and chat as they wait for the [street]cars. Their talk is of Mrs. Southworth, and it is claimed that they cut great splinters out of the porch and side of the house, and even capture the bugs and grasshoppers in the yard for souvenirs….” There is talk of people seeing the ghost of Mrs. Southworth walking up and down on the veranda, wringing her hands. The photo merged into the shot above is from the cottage’s days as a tourist trap. Sadly it was torn down in 1942 and modern buildings designed to look old were built in its place. Interestingly, the house built on the site of the cottage was the house used in the Exorcist.